Gantt Excel is the answer to your needs. It doubles up as a Project Budget Template and makes working with Project budgets and costs easy, fast and even enjoyable. An essential factor of managing successful projects is creating and tracking an accurate project budget. This can be a difficult task as project scopes and timelines are constantly changing. Using a project budget planner will help you stay on top of your project budget. With this excel template, you can track the material, labor, and fixed costs associated with each project task, and monitor the variance between your actual and budgeted amounts. Our Gantt Excel template allows you to track your project and expenses in one view. You can keep a close watch on the budget, the actual expenses of your project as well as manage your resources and costs for multiple employees, contractors and vendors or suppliers. 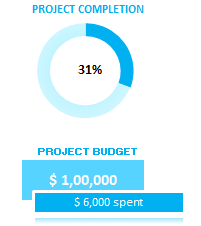 The look of our project budget template is sleek, clean and professional. This first screenshot tells us that the project is 31% and the project budget was set to $1,00,000 and that $6,000 has already been spent on it. 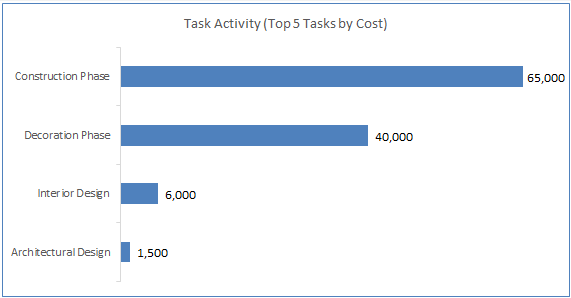 This second screenshot shows us a high-level overview of task costs. Make sure your project stays on budget throughout the entire project by tracking labor, materials, fixed costs, and actuals. A project budget template helps you stay diligent with spending and lets other team members know if you are over or under. This template is helpful for any project, regardless of size and it is very easy to use.